SAINT LOUIS, May 12, 2012 -- After four rounds of the 2012 U.S. Championship, an upset victory by GM Gregory Kaidanov has catapulted him into a first-place tie with GM Hikaru Nakamura. Yesterday was a rest day for the players of the 2012 U.S. Women’s Championship. Kaidanov scored the upset of the event by beating the seemingly heretofore unbeatable GM Gata Kamsky. Kamsky, with the black pieces, misplayed the move order after his pawn sacrifice with 14…b5!? Kamsky said he thought he would be about equal after the correct 15...cxd4 instead of 15…Bb7? Kaidanov took control of things with the excellent 17.dxc5! and never looked back, winning an excellent game. "Well, I blundered," Kamsky said. "After dxc5 I was much worse." 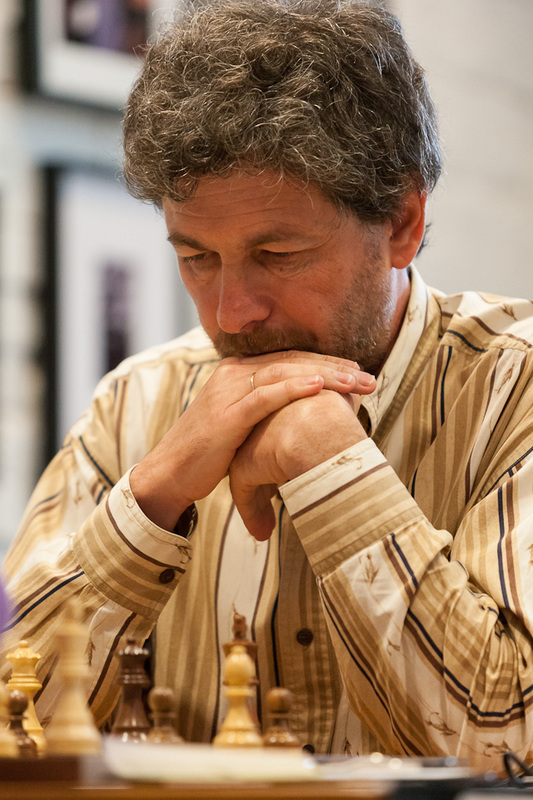 Kamsky had lost only once with black in eight previous U.S. Championship appearances. That game took place in 1993 against none other than Kaidanov. Kaidanov, who only received an invitation to the event because 2011 U.S. Junior Champion Gregory Young declined, is making the most of his chances. "Over the years, Gata's saved so many lost positions, some of which were dead lost," he said. "So until the very end, I didn't believe I could win." This marks Kaidanov’s 18th U.S. Championship appearance. He’s managed to secure two second-place finishes in past events, but the title of U.S. Champion as of yet has proved too elusive. He has a crucial matchup tomorrow against Nakamura. Just before reluctantly acquiescing to a peaceable draw with GM Alexander Onischuk, Nakamura was visibly frustrated at the board. Nakamura said he was inspired by GM Jesse Kraai, who played b6 against Onischuk two times prior. "I just felt like trying something different,” he said. Onischuk probably should have tried to castle kingside with 16.Bf2 and 17.0-0, but instead castled queenside. Both players thought they had a good position, but Onischuk said he simply blundered with 17.Nf5? However, this move was probably not so bad after all, as white kept the balance, and a draw was agreed soon after time control. In the post-game interview, Nakamura attributed his newfound affinity for the bishop pair to his brief training partnership with former World Champion GM Garry Kasparov. Onischuk dismissed the notion. "Frankly, I think everyone prefers two bishops," Onischuk said. After the post-game analysis, Nakamura discussed the game between Kaidanov and Kamsky, which was still being played at the time. "Gregory's playing a very good game, and he's a strong player, and Gata isn't having one of his better days, but that happens,” Nakamura said. The game between GM Varuzhan Akobian and GM Alex Lenderman was a well-played draw. "The opening was preparation,” Lenderman explained. “It's a new idea, but it's been played before by a Russian grandmaster, Popov, but no one else has played this idea." Indeed, Popov has played this line with 8...g5 and 9…Ne4 before with a +1 score. 14...Qe7 was a novelty, as Popov had played 14...Qd6 in an earlier game and drew, although 14...Qf6 may be best of all. "Alex found a very good move, Bc7," Akobian said. This allowed Lenderman to escape with his king, castling safely, and a draw was the fair result. Round four also featured a battle of the tournament's two youngest players, GMs Ray Robson and Robert Hess. Robson played the very unusual 7.Nbd2, and Hess was on his own early. In fact, IM Marc Arnold, Hess' second, said they were up till about 4 a.m. that morning preparing a line against 3.Bb5. Robson, however, threw a wrench in the prep, unleashing Bc4 on move three. "I wanted to surprise someone in the opening instead of being surprised all of the time," Robson said. Robson didn't get any advantage from his unusual opening, but Hess played quite passively and couldn't find a good plan. Robson increased his advantage methodically, and won a strategically beautiful game. "I didn't make any good moves, that's the problem," Hess joked. "But no, Ray played well today." The next game to finish was the long battle between GMs Yury Shulman and Alex Stripunsky. Both players had the edge at different points, but neither could gain a significant advantage, and a draw was a fair result. The best chance was for Stripunksy to play 32...f5! with the edge. A win for Shulman would have launched him into a first-place tie with Kaidanov and Nakamura. Although he wasn’t able to convert the full point, this result represented a nice comeback for Stripunsky, who started with 0-2, and now has 1.5 out of his last two games. GM Yasser Seirawan won the longest game of the tournament against GM Alejandro Ramirez, as it looked like an easy ending win for white. But Seirawan’s technique let him down, and he had to win the game all over again. Black was in severe time trouble the last 20 moves, getting down to less than 5 seconds on the clock several times. The last drawing chance would have been 86...Rc5! Round four of the U.S. Women's Championship and Round five of the U.S. Championship will begin at 1 p.m Central, 2 p.m. Eastern. Turn in to www.uschesschamps.com for live commentary and to follow all of the games live.